Mont Ventoux is situated in Provence-Alpes-Cote d’Azur and belongs to the Massif des Cèdres. It can be seen from almost everywhere in Provence and the isolated position it holds makes it a gigantic and dominating feature. In all directions you’ll see no higher peaks. 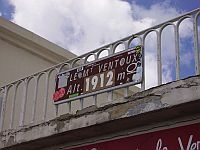 The name Mont Ventoux means “windy mountain” and more often than not it lives up to the name. There are three equally good roads to take you to the top starting from either Malaucène, Bédoin, or Sault. Starting from Malaucène as we did the ascent is 21km long. Over this distance you climb 1,535m which is an average percentage of 7.2%. If you’re in Provence we’d certainly recommend a visit but be warned it is a busy destination and very popular with cyclists. Keep an eye out for the memorial to Tour de France cyclist Tommy Simpson near the summit. It marks the spot where he sadly died from heat exhaustion during the 1967 Tour.